Are you looking to securely destroy your confidential papers or are you cleaning up from all your summer jobs, getting ready for winter and have leftover cleaners, solvents and chemicals you want to dispose? 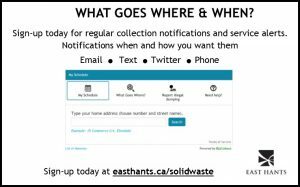 East Hants is hosting two (2) solid waste community events this fall — Residential Household Hazardous Waste (HHW) mobile drop-off and Paper Shredding. 1. To improve traffic flow at our events, we are asking residents to please complete the pre-registration form (to follow). Ensure all containers are sealed securely. Transport materials in the trunk of your car or back of your truck. Bring materials in open-topped boxes (we can return these to you). We recommend you wear gloves when handling products. Follow traffic signs and instructions at the mobile events to ensure the safety of everyone. 3. The following will not be accepted at the events. Residents can contact their oil retailer for used drop-off locations. Retail locations that sell oil must either receive or provide drop-off options. Leftover paint can be taken to any ENVIRO-DEPOT™ free of charge. With consumer fraud and identity theft on the rise, East Hants wants to provide an opportunity for residents to have their confidential documents destroyed. Please follow traffic signs and instructions at the events to ensure the safety of yourself and others.